Whether you want to create custom or replacement parts or build an entire automobile body, this metalworking course for gearheads from best-selling automotive restoration author and professor Ed Barr will take you as far as your interests reach. Barr demystifies this seemingly black art with information on tools and basic skills and 14 customizable projects, fully illustrated with step-by-step color photography. First, you'll learn how to assemble your ideal toolkit, as well as how to build a power hammer and an English wheel. In the process, Barr will help you make informed choices based on available space and budget. Once you're all set up, he addresses the concepts of shape and form. The projects are presented in a way that you can easily apply them to their own vehicles, whatever they may be. Barr also takes the time to show how the projects can be accomplished with different available tools. As you go, you'll gain the skills and confidence for tackling the increasingly complex cases presented. Work your way up to building a fender utilizing the wheeling machine you built earlier; then move on to building a Model T speedster body and an Indy car, and later a challenging ' 34 Plymouth fender. The book even includes common goofs and how to avoid and, if necessary, correct them. 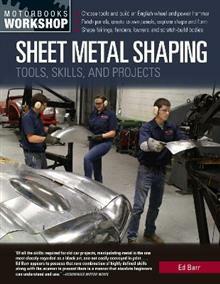 Written in an engaging and approachable style, Sheet Metal Shaping serves equally well as a useful supplement to Barr's previous Professional Sheet Metal Fabrication or as a must-have standalone volume for any fabricator's library.